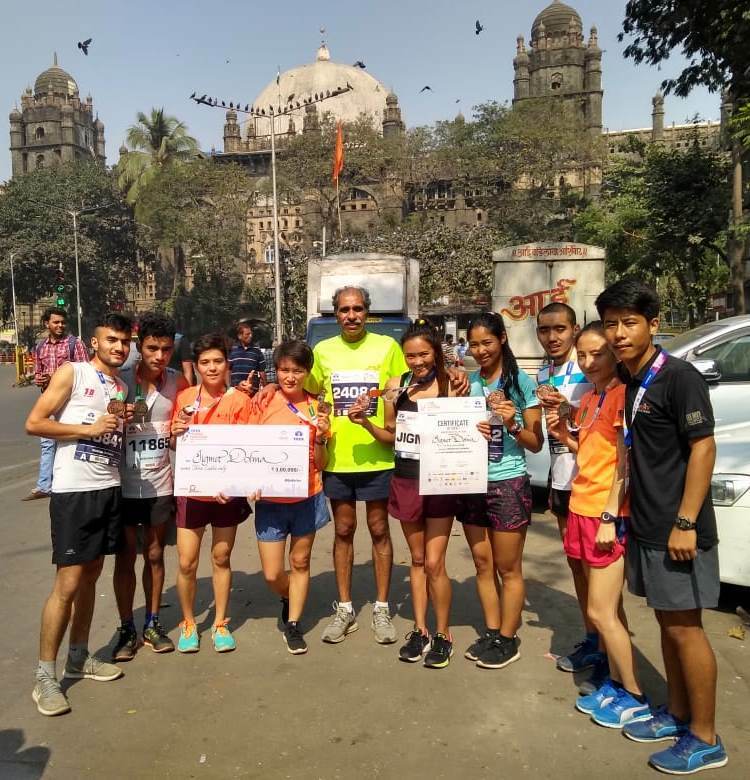 For the runners from Ladakh visiting Mumbai every year for the city’s annual marathon, the 2019 edition of the event was noteworthy. Jigmet Dolma finished third among Indian women in the elite category. It was around mid-November 2018 that five runners – Jigmet Dolma, Tsetan Dolkar, Manzoor Hussain, Nawang Tsering, Khadim Hussain, Tashi Lador and Diskit Dolma – traveled from Ladakh to Delhi commencing another season of participating in running events across India. From the assembled team members, Jigmet, Tsetan and Manzoor were focused on the full marathon. The rest were into the half marathon and distances shorter than that. After two days in Delhi, the team shifted to Darjeeling, a town in the Himalaya with elevation suited for training. It also has its own community of runners. Most important – for Leh based-Rimo Expeditions, which has been sponsoring this annual outing by Ladakhi runers, Darjeeling is second home. They have a good base there with infrastructure to support the runners. The team stayed in Darjeeling till December 13. Then, they moved to Kolkata for the Tata Steel 25k race of December 16. At this race, Jigmet and Tsetan placed eighth and ninth respectively, in the elite category. Tashi and Diskit participated in the 10 kilometer-race of the same event. Tashi finished second in the open category for women while Diskit placed fourth, Tsering Stobgais, team manager, said. The young man – a runner, he now studies in Delhi and discharges the duties of a team manager – hoped to eventually sculpt a career as certified coach. Three days later, on December 19, the team reached Mumbai, home of their coach Savio D’Souza. In Mumbai, an eighth member – Stanzin Chundol – also joined the team. With the running tracks at Priyadarshini Park and the university stadium inaccessible, their training was mostly at Marine Drive that huge arc of a seaside promenade, a picture of which is unmistakably Mumbai. Marine Drive is also regular haunt for many city based-runners. Every morning and evening you find people running here; on weekends several group runs originating in the suburbs head here. According to Tsetan, the weather was a bit of a challenge on race day. “ It was fine when the full marathon started. But as the race progressed, it began to get really warm,’’ Tsetan, who grew up in the high altitude colder weather of Lamayuru, said. In fact, news reports by the end of race day, would talk of several runners experiencing dehydration at 2019 TMM. Weather notwithstanding, the Ladakh team scored a milestone. Their strongest runner is Jigmet Dolma. In 2017, the year she and Tsetan raced for the first time in Mumbai in the elite category for Indian women, Jigmet had placed third with a timing of three hours, 14 minutes, 38 seconds. In 2019, with an improved timing of 3:10:43, she placed third again. Tsetan finished in fifth position; her timing too improved, from three hours, 14 minutes, 42 seconds in 2017 to 3:13:05. Further according to Tsering Stobgais, Manzoor Hussain placed fourth in his age category, completing the full marathon in two hours 54 minutes. Manzoor’s timing at 2019 TMM is among the best reported by runners from Ladakh at TMM. From others in the team, Tashi placed fourth in her age category and seventh overall in the half marathon, Stanzin was sixth in her age category and ninth overall and Diskit was sixth in her age category, Tsering said. TMM done, the team was set to participate in the Thane Hiranandani Half Marathon of February 10 (where they would divide their interest between the half marathon and the 10K) and finally, the IDBI Federal Life Insurance New Delhi Marathon of February 24. By March, the team should be back in Leh. A pattern visible in the team’s performance has been Jigmet and Tsetan finishing races, one following the other to the finish line; typically Jigmet in the lead and Tsetan following. Tsetan who also wishes to be a coach in the future, said that her goal is to do a sub-three marathon. The target has a reason, one that probably reminds both Jigmet and Tsetan of more work to be done. The best known woman marathoner from Ladakh is Rigzin Angmo. Back in February 1996, in New Delhi, she recorded her personal best in the discipline – 2:45:42. Amid the podium finishes the new lot of Ladakhi runners have been gaining, that’s something to dwell on.